Here in the Pacific Northwest, it’s starting to feel like fall. The leaves are changing, the temperatures are dropping and it’s getting dark earlier. If that wasn’t enough, Starbucks has started serving the ever-popular Pumpkin Spice Latte. There’s something so comforting about hot coffee and a warm blanket this time of year. 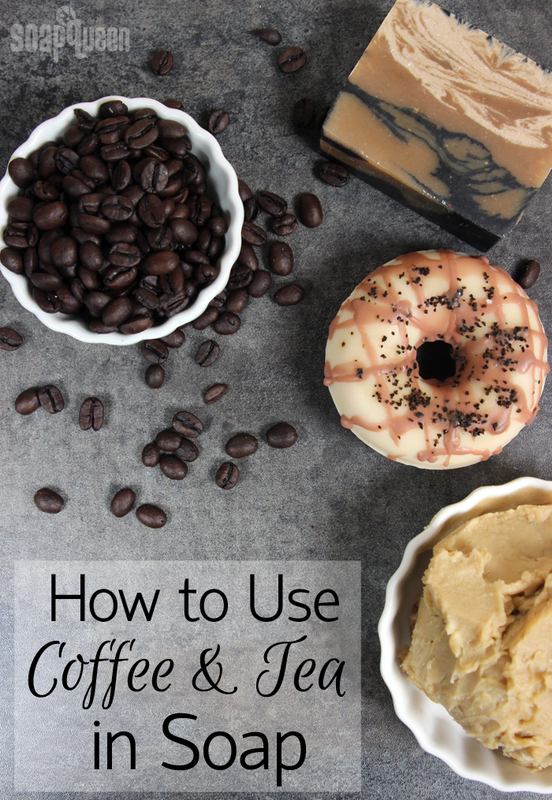 If you’d like to translate that feeling to soap, check out the tips and tricks for incorporating coffee and tea in different ways into your recipes. Coffee grounds add exfoliation and an interesting look in soap. They are considered a large exfoliant, meaning they will be more scrubby than something fine grained like sugar. Read more about exfoliants here. Coffee grounds are perfect for exfoliating the body, especially dry areas like feet and elbows. Used coffee grounds are best for both melt and pour and cold process soap. Dry grounds can bleed in the soap, creating a halo of color. After making a pot of coffee, place the grounds on a towel and pat dry. A general usage rate is about 1 teaspoon per pound of soap. If you want your soap scrubbier, you can add more from there. For melt and pour soap, add the used coffee grounds to melted soap and stir well. Keep stirring until the soap is around 125-130 °F. It needs to be thick enough to suspend the coffee grounds evenly. Then, pour into your mold. The Espresso Melt and Pour Soap Bars are made with rich Espresso Fragrance Oil. In cold process soap, add the grounds at trace and whisk gently to combine. 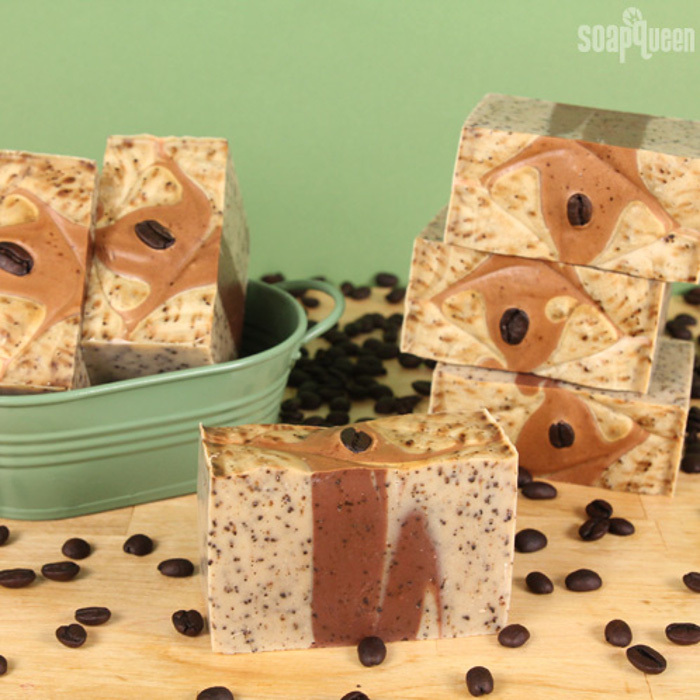 It will give your soap a lovely rustic look, as seen in the Espresso Shot Cold Process Tutorial. Coffee grounds add exfoliation and interest to the Espresso Shot Cold Process Soap. 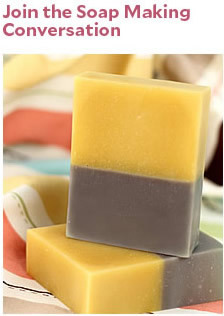 You can also add tea leaves or ground tea to your melt and pour and cold process soap. They can be added the same way as coffee grounds. That includes incorporating used tea leaves in your batch instead of dry, unused leaves. Make sure to pat them dry before use. Then, add the leaves and stir well. In our tests, we found the tea leaves go brown and tend to bleed in the final bars. Used tea leaves will bleed a bit less. That’s something to keep in mind when designing your soap. Coffee butter is a luxurious way to give your soap a pick me up. It contains .5-1% natural caffeine. In cold process soap, it can be used up to 6% in your recipe. It also works well in lotion, scrubs, etc. We added it to the Charcoal and Cedar Beer Cold Process Soap to help moisturize the skin. The Sahara Sunset Cold Process Tutorial has coffee butter and avocado butter for an ultra luxurious feeling. The butter does have a rich coffee scent on its own, but is very subtle in the finished soap. To bump up the fragrance, you can use Espresso Fragrance Oil, Turkish Mocha Fragrance Oil or Chocolate Espresso Cybilla Fragrance Oil. 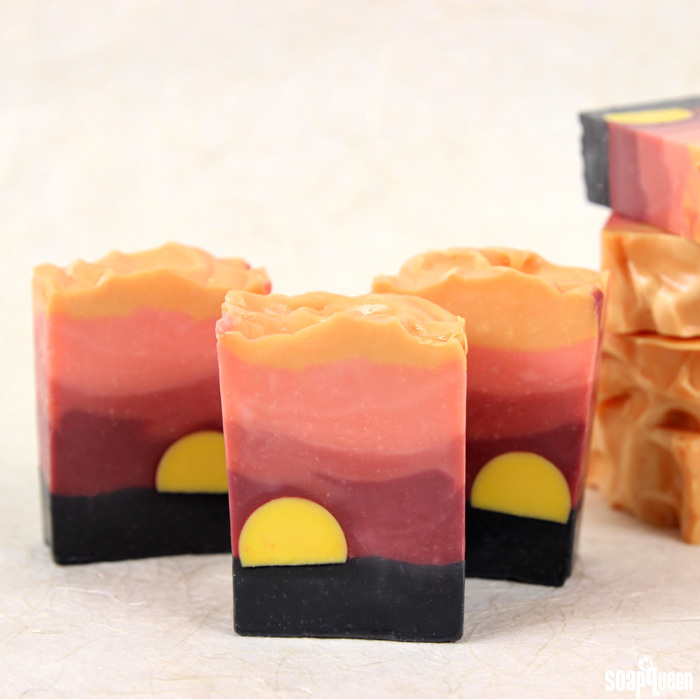 The Sahara Sunset Cold Process Soap is made with coffee butter and avocado butter. Coffee and tea can be used in place of, or in addition to distilled water in your cold process soap recipe. They add color and a very subtle scent to soap. They’re also great from a marketing standpoint – coffee and tea fans will love it. They do require a bit of prep before getting started. How strong you make the coffee and tea is personal preference. If you want a fairly dark color and slightly stronger scent, you can brew a strong batch. For less of a color and scent impact, you can brew a slightly weaker batch. Mixing the tea or coffee with distilled water can help prevent some of the discoloration as well. Instead of using it at 100% of the liquid amount, you can reduce that to 50% or so. Use the Lye Calculator to find out how much lye and liquid to add to your recipe. Once your coffee or tea is brewed, it needs to chill in the fridge for several hours, up to overnight. When the lye is added to the liquid, it reacts and heats up the mix. If the coffee or tea is at room temperature, that can cause darker discoloration. It also creates a fairly unpleasant smell. Those of you who make coffee and tea soap know what I’m talking about! Cooled liquid will discolor and smell a bit less. What color the liquid turns depends on what you’re using. We’ve found green tea turns a medium brown color. Coffee turns green when the lye is added, then morphs into brown. 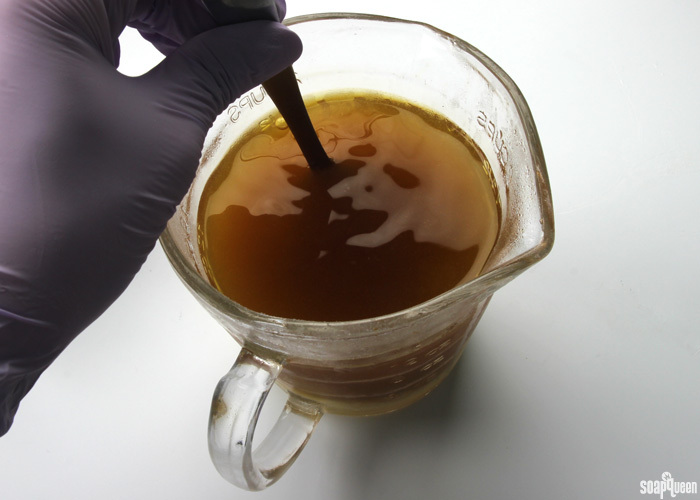 This green tea turned brown once the sodium hydroxide lye was added. 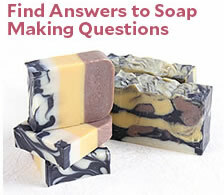 Adding color to the soap can be a bit tricky because of that discoloration. Titanium dioxide will lighten the batch so the colors will be more vibrant. Learn how to use titanium dioxide here. The Exfoliating Green Tea Cold Process Bars have a white and green color palette to complement the tea. For a bit of exfoliation, Forest Green Jojoba Beads are added to the top layer. You can also embrace the discoloration! Adding a bit of Cappuccino Mica to the soap will create a rich brown color. A mica line, like the one in the Gold Mine Cold Process Soap, would be a nice touch as well. Looking for a recipe made with coffee? Check out page 130 my book, Pure Soapmaking. We’re also planning a coffee soap tutorial on the blog in the future. Titanium dioxide helps lighten the discoloration in the Exfoliating Green Tea Cold Process Bars. If you would like to incorporate the smell of tea or coffee into your products more strongly, fragrance oils are the way to go. Bramble Berry carries a variety of tea and coffee inspired scents. Use the Bramble Berry Fragrance Calculator to find out how much fragrance oil to use in your products. If you’re using tea or coffee in your products in the form of liquid, coffee ground, tea leaves, coffee butter, etc., adding a matching fragrance oil is a great way to create a cohesive product. Check out the fragrances below to find the perfect tea or coffee scent for your project. 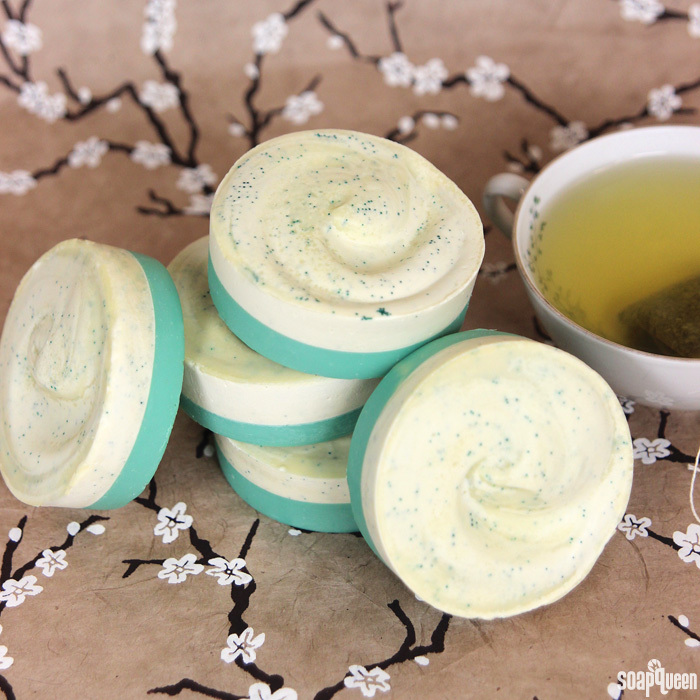 Do you like to use coffee and tea in your soap? How do you incorporate it?